clamping solutions, industrial and DIY CNC spare parts and accessories. Our wide range of CNC products are made in Germany and match our passion for quality and precision. 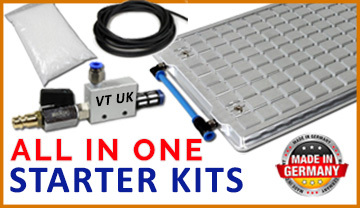 screw thread grid plates and our DIY VacEasy Series and starter kits. 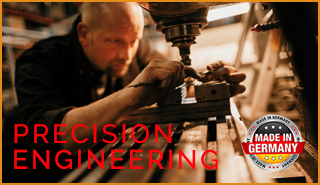 the very best choice for all your CNC milling and manufacturing needs. Need a custom vacuum table or T-slot plate? Create your custom vacuum table or t-slot plate using our custom design service. 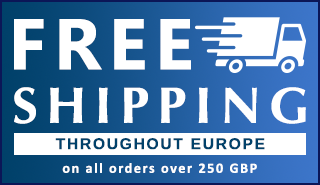 Free shipping throughout Europe on all orders over 250 GBP. Conversation avec un de nos ingénieurs français maintenant. 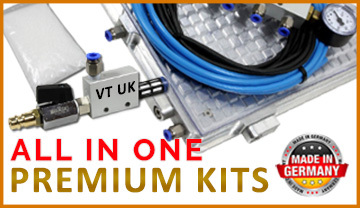 Our premium vacuum kits are the best value, best quality All In One vacuum ..
Our vacuum tables are designed for the machining of metals, woods, pap..
Our aluminium T-slot plates are made of solid cast aluminium with a smooth ..
We sell a range of industrial CNC vacuum pumps and generators such as; liqu..
Our classic T-slot plates can be manufactured in many different..
Our vacuum pads and cups are single tools which, in principle, everyone can..
Our All in One DIY starter kits provide everything you need to get going on.. Here you will find spare parts and accessories for your vacuum tables, t-sl..
Pneumatic clamping and equipment suitable for use with our vacuum tables in..
Our Screw Thread Grid plates are the perfect addition to any CNC mill where..
T-slot nuts produced from steel or aluminium suitable for our steel T-..
Our clamping force boosters offer a wide range of applications and increase..
Read and watch videos of our products in action. All there is to know about vacuum clamping technology, our products and services. Our aluminium grade (5083) 5040 t-slot plate has a smooth underside and can be easily suctioned on to a vacuum table. Making it easy to mount with vic..
Our aluminium grade (5083) 15040 t-slot plate has a smooth underside and can be easily suctioned on to a vacuum table. Making it easy to mount with vi..
Our aluminium grade (5083) 8020 t-slot plate has a smooth underside and can be easily suctioned on to a vacuum table. Making it easy to mount with vic..
Our aluminium grade (5083) 5020 t-slot plate has a smooth underside and can be easily suctioned on to a vacuum table. Making it easy to mount with vic..
Our aluminium grade (5083) 200150 t-slot plate has a smooth underside and can be easily suctioned on to a vacuum table. Making it easy to mount with v..
Our aluminium grade (5083) 8040 t-slot plate has a smooth underside and can be easily suctioned on to a vacuum table. Making it easy to mount with vic..
Our aluminium grade (5083) 15060 t-slot plate has a smooth underside and can be easily suctioned on to a vacuum table. Making it easy to mount with vi..
Our aluminium grade (5083) 30080 t-slot plate has a smooth underside and can be easily suctioned on to a vacuum table. Making it easy to mount with vi..
Made from C45 grade steel the 5020 t-slot plate has a smooth underside and can be easily suctioned on to a vacuum table. Making it easy to mount with ..
Made from C45 grade steel the 6020 t-slot plate has a smooth underside and can be easily suctioned on to a vacuum table. Making it easy to mount with ..
Made from C45 grade steel the 4020 t-slot plate has a smooth underside and can be easily suctioned on to a vacuum table. Making it easy to mount with ..
Made from C45 grade steel the 7050 t-slot plate has a smooth underside and can be easily suctioned on to a vacuum table. Making it easy to mount with ..
Made from C45 grade steel the 6030 t-slot plate has a smooth underside and can be easily suctioned on to a vacuum table. Making it easy to mount with ..
Made from C45 grade steel the 8040 t-slot plate has a smooth underside and can be easily suctioned on to a vacuum table. Making it easy to mount with ..
Made from C45 grade steel the 5030 t-slot plate has a smooth underside and can be easily suctioned on to a vacuum table. Making it easy to mount with ..
Made from C45 grade steel the 8050 t-slot plate has a smooth underside and can be easily suctioned on to a vacuum table. Making it easy to mount with ..
Our grid vacuum table VT3030 RAL Pro is a quick and easy clamping solution for CNC systems. Ready to use with a venturi tube this vacuum table is fast.. Specifications: Material: Aluminum, PolyethyleneExternal dimensions: 810 x 600 x 29 mm Clamping surface: 800 x 600 mm Height: 29 mmHole g..
Our grid vacuum table VT6040 RAL Pro is a quick and easy clamping solution for CNC systems.Ready to use with a venturi tube this vacuum table is fast .. Specifications: Material: Aluminum Clamping Dimensions: 430 x 310 mm External dimensions: 450 x 330 mm Height: 24 mm Spacing: 10 x 10 mm Holes: ..
Our grid vacuum table VT5040 RAL Pro is a quick and easy clamping solution for CNC systems.Ready to use with a venturi tube this vacuum table is fast .. Specifications: Material: Aluminum Clamping Dimensions: 600 x 400 mm External dimensions: 616 x 416 mm Height: 26 mm Spacing: 10 x 10 mm Holes: 0.6 m.. Specifications: Material: Aluminum Clamping Dimensions: 310 x 220 mm External dimensions: 330 x 240 mm Height: 24 mm Spacing: 10 x 10 mm Holes: 0.. Specifications: Material: Aluminum Clamping Dimensions: 850 x 610 mm External dimensions: 870 x 630 mm Height: 34 mm Spacing: 10 x 10 mm Holes: .. I needed some technical help to decide on which T-slot to buy. Spoke to Jonathan and got the answer straight away. We've been a customer for several years. If there's something we can't find they will even source for us. Great service! I nearly bought the wrong product accessory. but thanks to Jon he got in touch with me straight away and advised me on the right one. You don't get better than that.